Mehndi designs latest images & trends you need to see right now! All the mehndi designs latest images you have been looking to save are right here! Scroll down to see the latest mehndi designs for hands and legs that are ruling the wedding scene right now! Both the bride and the gang of ladkiwale can save these mehndi designs latest images and share in their shadiwale groups on WhatsApp for major inspiration! If you are done with painting your palms with Indian and Arabic mehndi designs, then these Egyptian henna designs are the perfect choice for you. These mehndi designs commonly include motifs like the Wadjet Eye (known as the symbol of protection) and the Blue Nile Lotus (symbolises purity and resurrection), which have been around ancient times! Get yourself a cool and quirky mehndi like this to stand out from the crowd! If you are looking for the latest mehndi designs for hands that have a contemporary style, then these lace glove motif designs make for a fine choice. They have floral patterns along with intricate mesh motifs that make it resemble a lace glove! While Aztec patterns are a popular motif for permanent tattoos, it has recently started being used into henna designs. If you fancy geometric shapes, fine lines and symmetric patterns, then Aztec mehndi is something you should definitely give a shot! Channel your inner bohemian chic with these latest mehndi design images and use them as a reference for your next festive occasion! If you are a quirky bride who wants to try something different, then these boho henna designs are all that you need to show your mehndi artist for inspiration! Apart from the Indian sub-continent and Egypt if there is any other place that has been using henna since ancient times, it is Morocco. Just like Aztec mehndi, this latest mehndi design uses a lot of geometric shapes, especially the diamond shape. Khaleeji, also known as the Persian Gulf is an unusual style of mehndi design, which makes use of free-flowing patterns, unique layouts, whimsical floral, negative space and abstract motifs. If you love bold and eye-catching henna designs, then Khaleeji is the latest mehndi design you should definitely give a try! While peacocks have been a prevalent motif in traditional Indian mehndi designs, birds like sparrows and parrots have come in the picture recently. If you like cutesy mehndi patterns, then these latest mehndi design with birds images are a must-save to your phone! 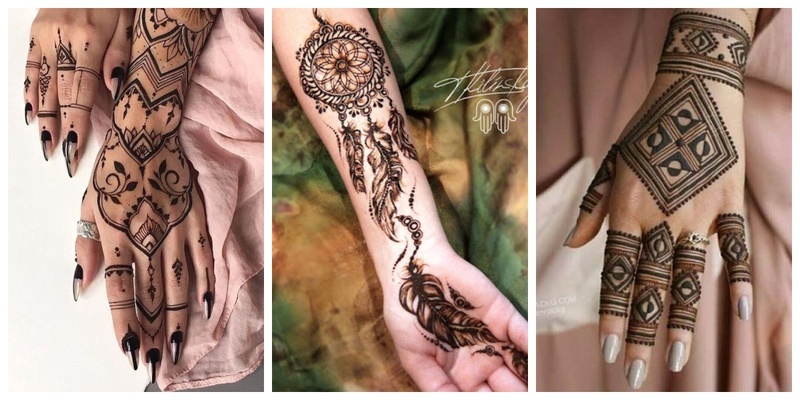 If you are looking for dainty and latest mehndi designs to wear for Eid, Karwa Chauth or smaller festive occasions, then these mehndi designs with crescent moon motifs are something you should certainly try! Who wants to wear bracelets when you can design them on your wrist, right? These latest mehndi designs for hands have floral motifs along with bead-strings and are drawn to resemble hand-chains, bracelets or bangles! Let us know if you liked any of these mehndi designs latest images, and if you want to see more such mehndi pictures in the comments below!